Prepare for a positive hospital birth for you and your baby. The prospect of giving birth is in itself a scary prospect and hospitals are not places we look forward to visiting. Even visits to see loved ones in hospital can be anxiety provoking experiences. We have developed the Positive Hospital Birth CD for use during your pregnancy to create a more relaxed attitude to your hospital stay and a more confident approach to giving birth. Your Positive Hospital Birth CD assists in reducing discomfort, eliminating anxiety and fear while you are fully aware and focused. Hypnosis has been shown repeatedly to reduce the perception of pain in labour and increase the likelihood of a normal birth. Women using this CD find the intensity of the sensations are more easily managed and they can move about freely, adopting positions that promote your baby’s movement through the pelvis. This CD can also be used if you are planning on having an epidural as a way to stay more comfortable in the early stages of labour before your epidural is available. We recommend using this CD daily in the last trimester including waiting for hospital appointments and during the birth process if needed. As you practice at home you'll find that you can easily tune out distractions and choose to remain calm and focused - even in a busy hospital. Six simple breathing techniques for labour. Pregnancy is a time of change and celebration, as well as anticipation and anxiety. Practicing the breathing techniques on this CD can help you adjust to the physical and emotional demands of pregnancy and birth in a more relaxed and positive way. Breathing is the most readily accessible resource you have for staying calm and focused during your baby’s birth regardless of how your labour progresses. Mastering these easy breathing techniques can be achieved with practice. Each session lasts a maximum of 10 minutes so you can easily incorporate your practice into the busiest of days. The full CD lasts 60 minutes with built in short practice sessions. Practice your breathing techniques as often as possible – at work, driving, in bed, watching TV and during any physical examinations during pregnancy and birth. The more your practice becomes a 'habit', the more naturally they’ll come to you during your baby’s birth and the more in control you’ll feel. These easy-to-follow exercises are suitable for all expectant Mums. Slow focused breathing is the foundation for a calmer birth for you and your baby. These techniques can also be used during a caesarean section. This product is available as an Instant MP3 Download or Physical CD. Making the decision to go for VBAC can be a stressful one. Well meaning friends and family members sometimes can't understand why wouldn't choose the 'easy' option of a planned caesarean section. As you know caesarean birth is far from an easy option - and now you will have a toddler to consider too. Giving birth is a rite of passage and many women feel they missed out in someway by not experiencing a vaginal birth. Prepare for your VBAC. Boost your confidence as you look forward to a positive birth experience. Many women planning VBAC question their ability to give birth vaginally, especially if their previous birth ended in an unexpected caesarean birth. The loss of control can become an overwhelming fear. A planned repeat caesarean may be the safest choice in a small number of situations, but for most mothers and babies the overall risks of surgical birth outweigh VBAC risks. Many women planning a VBAC will have unique emotional issues to resolve. Sometimes the emotions within themselves are enough to impede their chances of achieving a normal birth. Take time to consider how you are feeling before the birth, and try to work through your emotions before labour. The GentleBirth Confident VBAC CD will increase your feelings of control by rebuilding your confidence in birth and your trust in yourself and your baby with encouraging positive imagery and self hypnosis for a more positive, fear free birth experience. 1 in 4 Mothers in Ireland will give birth by caesarean this year. In Tracy Donegan’s latest guide to birth in Ireland she explores the epidemic of surgical births in Ireland and the growing number of women choosing VBAC (vaginal birth after caesarean). The Irish Caesarean and VBAC Guide provides answers to the many overwhelming questions associated with caesarean birth and VBAC. Informative and supportive, The Irish Caesarean and VBAC Guide critically examines the risks and benefits of surgical birth and VBAC in an easy to read format for all expectant parents to consider when making informed decisions about their care. o Tips from Irish women – what they wish they’d known. o Strategies to help you avoid an unnecessary caesarean. o How you can have a positive caesarean birth. o Recovering from a caesarean birth – healing physically and emotionally. o Breastfeeding and caesarean birth. o Once a caesarean always a caesarean? o VBAC in Ireland – how to stack the odds in your favour of a safe, empowering VBAC. o The latest research and recommendations for safer caesareans and VBAC. 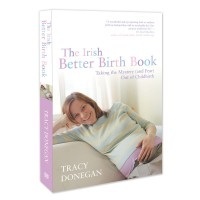 Tracy Donegan is the author of the Better Birth Book – Taking the Mystery and Fear out of Childbirth (Liffey Press 2012). Tracy is the Founder of Ireland’s first professional Doula service and is a Certified Doula trainer for DONA International. Tracy is also the Founder of the GentleBirth positive birth program. Tracy is married with two sons and lives in Meath. "The Irish Better Birth Book" is the first of its kind in Ireland. Right from the initial positive pregnancy test this highly useful guide takes expectant parents through the maze of information and choices available as they plan for one of the biggest events of their lives - the birth of their baby. More importantly, by asking the tough questions other pregnancy guidebooks avoid, "The Irish Better Birth Book" helps mothers understand the critical decisions that they need to make in order to actively participate in their own healthcare. In addition to providing comprehensive guidance and advice on how to have a stress-free and enjoyable childbirth experience, "The Irish Better Birth Book" also provides a wealth of data on the policies and outcomes at maternity hospitals in Ireland, the rates of caesareans, episiotomies and other invasive procedures, the growth in home births, water births and other alternative childbirth options and a comprehensive directory of midwives, birth assistants and other childbirth practitioners in Ireland. Preparing for any kind of surgery can be stressful. Understanding what happens on the day will go a long way in helping you feel more confident and relaxed. There are times when a caesarean is the safest way for a baby to be born but thoughts about surgery often generate anxiety in the weeks and months leading up to it. You can create a positive expectancy for your caesarean with the Positive Cesarean hypnosis CD. Our Positive Caesarean CD will increase your confidence so that your focus is on the wonderful experience of meeting your baby - not on the surgery. You'll feel calmer and more relaxed and look forward to the birth of your baby. As a relaxed, calmer Mum your partner will be more relaxed and less anxious too. Research has shown that a positive attitude speeds the healing process so you can be back to yourself and back on your feet in a shorter amount of time. Your body will react more efficiently to medication and your time in surgery is reduced simply by using hypnosis. A quick recovery with minimal complications after surgery is so important so you can focus on your new baby. This CD also includes our much loved New Mother Meditation to promote rest and recovery during these special days so you can get on with enjoying your baby. This CD includes positive suggestions and affirmations to prepare you for your caesarean and encourage your body to heal quickly and easily.